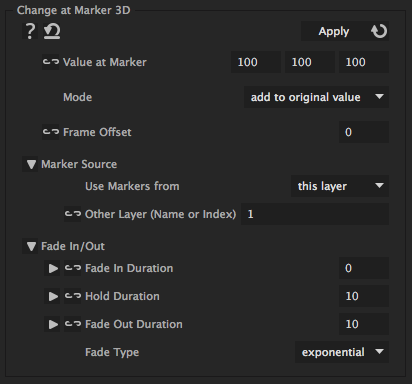 With this iExpression you can modify 3D properies (like the position or scale of 3D layers) at markers. At each marker you can either replace the keyframed value by another value or add something to the keyframed value. The changes at the markers can be faded it and out. Also, you can annotate comments like "50%" to individual markers, to decreate or increase the impact of this particular marker. the value that the property should at each marker (or which should be added to the regular value at each marker). determines whether the "Value at Marker" is added to at each marker to the original value of the property, or whether it replaces the original value. for -2, the modification already starts 2 frames before each marker. determines the number of frames over which the change at each marker is faded in. determines the number of frames over which the change at each marker stays before it goes back. determines the number of frames over which the change at each marker is faded out. determines whether the change at the markers fades in or out in a linear or exponential fashion.